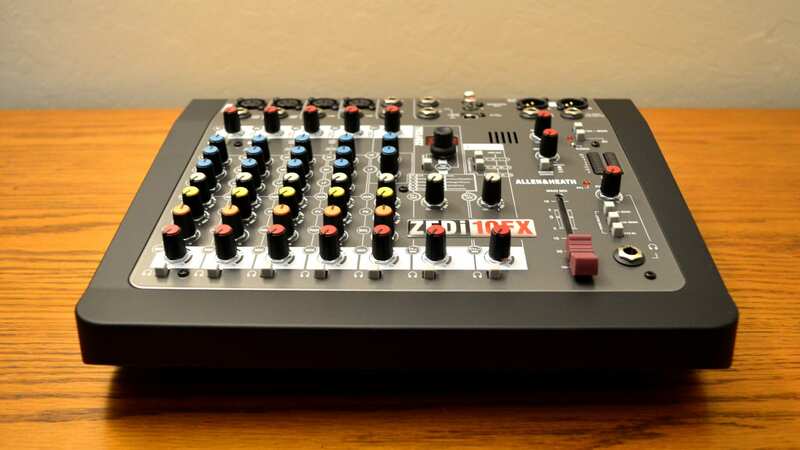 Finding a low-cost mixing console that’s durable and sounds great isn’t always an easy task. Mackie has come out with a few excellent ones over the years, but apart from that, you used to be out of luck. These days, however, there are a few more options. Like the Allen & Heath ZED and ZEDi series, for example. 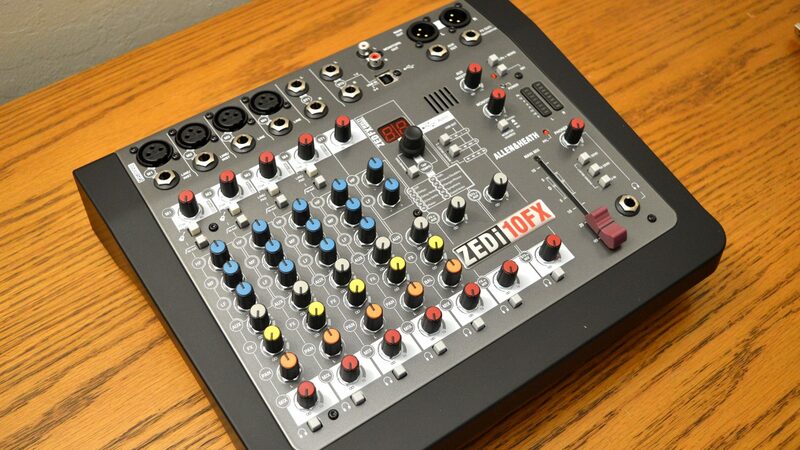 Well folks, we’re putting those two mixers to the test, starting with the Allen & Heath ZEDi-10FX. The Allen & Heath ZEDi-10FX isn’t your average mixing console — it’s also a recording interface with 4 inputs and 4 outputs, making it a very solid choice for those that tend to work live but want the option to record too. Allen & Heath has never been known for its design, but its gear has never looked bad either. That tradition seems to continue a little with the ZEDi-10FX, which most certainly looks more functional than beautiful. As would be expected from a console of this kind, the left side is dedicated to your channels. 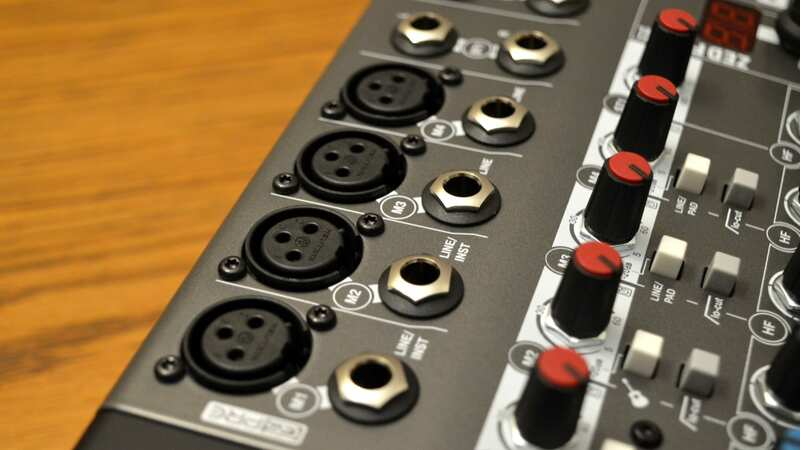 You’ll get four mono mic/line inputs, as well as three stereo inputs and the built-in FX inputs. 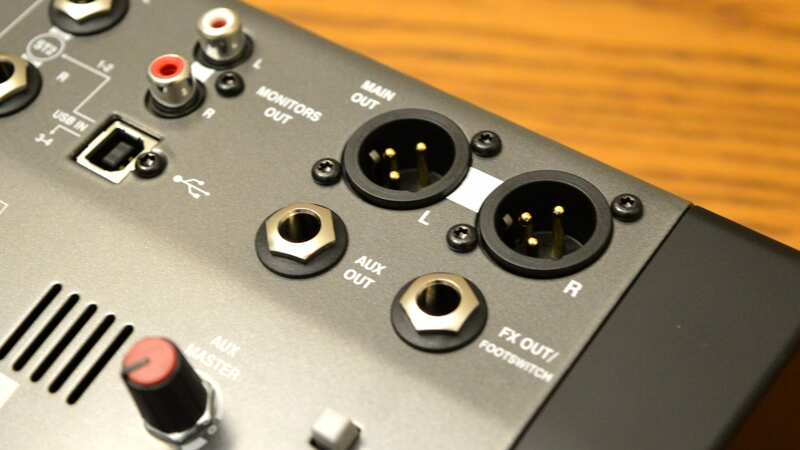 All of the four mono inputs offer XLR and balanced/unbalanced TRS inputs, while the stereo inputs stick to TRS. Next up are the EQs, and you’ll get a high, mid, and low knob on all four of the mono channels, while the first stereo channel is decidedly less equipped with only high and low knobs. The remaining knobs include an aux send, FX send, panning, and an overall mix level. 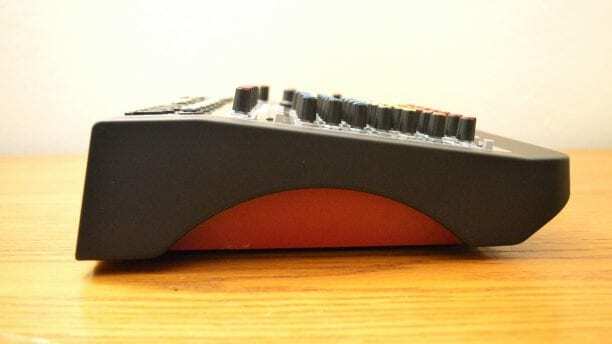 The aux send is pre-fader, while the FX send is post-fader — just something to keep in mind while in use. The second stereo channel can serve as either another stereo input, an FX return, a USB return from your DAW, or a source for the FX built in to the console. The third and final stereo input can only be taken from USB, and used to blend with the aux bus or mix bus with PFL. In the middle of the console are the FX controls. On the right side of the console you’ll find the master section, which has a long-throw fader, headphone controls, aux and monitor controls, and a phantom power switch — which is global. In general we kind of liked how the console looks, and it definitely grew on us. Sure, like we said, it’s not a design masterpiece, but its laid out to work well, and work well it does. 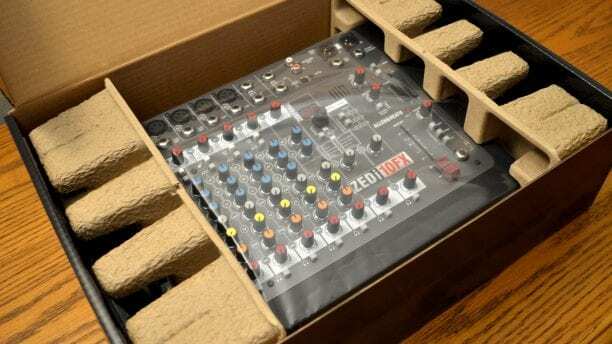 Using the Allen & Heath Zedi-10FX is just as simple as you might expect. All you need to do is plug it into your computer and get recording if you’re using it in a studio setting — and once you plug it in your DAW should pick it up very quickly. We used it with Pro Tools with no problems at all. Simply plug it in, boot up your DAW, and it should be picked up and good to go. Apart from little things like that, however, the Allen & Heath ZEDi-10FX is a very capable and useful little mixer. We tried recording a range of different instruments on the console, and while we’ll go into how that sounded later on, the experience was very fluid and easy. The GSPre micr pres have a ton of headroom for almost all situations, and the EQ’s, which have a smart Q that’s automatically controlled by the console, are absolutely simple. Last but not least, the Allen & Heath ZEDi-10FX is built to last. It should be able to handle most of the reasonable abuse you can throw at it, which is good news considering the people who will buy a small-format console like this are probably people who are also on a budget. It’s all well and good that the Allen & Heath ZEDi-10FX is laid out well and looks nice, but none of that matters if it doesn’t sound good. Thankfully, it does. The EQ certainly don’t give you as much control as you might want, but they sound pretty good nonetheless. There’s no denying that in studio situations you may want to rely more on plugins for your EQ needs, as you’ll be able to get much more surgical. 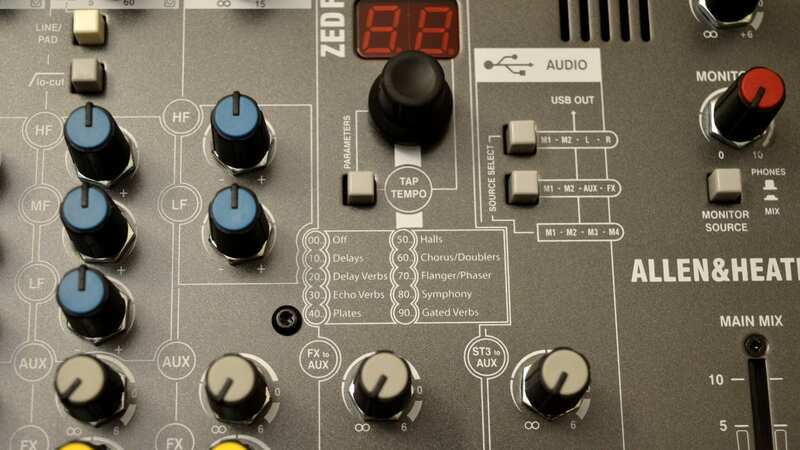 In live situations, however, the ZEDi-10FX is more than capable — sure, you don’t get to set the Q, but the Q the console sets for itself is very musical. Then, there are the effects. These effects are optimized for send and return use, so they’re all time-based — that’s to say you’ll get reverbs, delays, and some modulation effects. You get a hefty 61 presets, and you can adjust parameters and save presets yourself. Really they’re a dream for live engineers working in small settings. Again, in a studio situation you may find yourself relying a little more on in-the-box solutions — but in a live setting, where you don’t want to lug around a lot of gear, the effects included are versatile, sound great, and are easy to use. 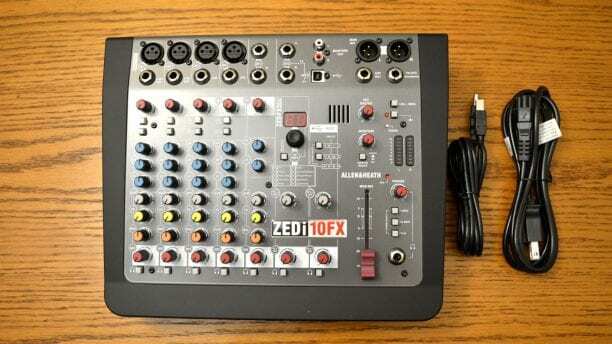 Nothing’s perfect, but for the price the Allen & Heath ZEDi-10FX is pretty damn close. The console isn’t the most stylish creation ever, but it more than makes up for that with top functionality, a great sound, and a ton of flexibility. If you’re a live sound engineer looking for a small-setting console, a studio guy looking for a solid starting point, or a mixture of both, this is the console for you.